most of your outdoor entertaining spaces, while also keeping safety and security in mind. Everyone wants a gorgeous outdoor space. Spaces that invite you to sit for a while, to have another glass of wine and linger in the warm, flower-scented air of evening. Being able to enhance a lovely outdoor design is, of course, just one reason why we light outdoor spaces. Aesthetics are fairly self-evident; you want a space that is nice, enjoyable and well designed. But there are also the elements of safety and security. Safety is critical, considering that dark outdoor spaces can be obstacle courses designed to twist ankles and break wrists. And when it comes to security, properly lit outdoor spaces make your home less of a target for ne'er-do-wells. Entertainment Spaces: This is lighting for entertainment and for gathering, and is the most immediately rewarding when done right. Well-lit patios, decks and balconies can transform a larger outdoor space and let you enjoy it more fully. Dining tables, lounging areas and fire pits also fall into this area. Safety Spaces: These are areas that have the potential to injure or harm. Look for edges between surfaces, like the edge of a patio and lawn, and spaces where heights change, such as stairs, decks and the like. Security Spaces: These are spaces where you want to ensure that nobody is going to mess with your home. Front and back doors, side yards, driveways and mailboxes are all areas to consider. Think about how the space is to be used and plan the outdoor lighting around that. Plotting out your lighting—and remembering the importance of light layering—is critical to getting the right effect and being able to create spaces for different uses. This is the most dense and most decorative of your outdoor spaces. This is also where the most exciting new developments in lighting design are happening. Have a dining table? Look at outdoor pendants. Outdoor seating areas? Check out table and floor lamps. The range of fixtures offered for the outdoors is exploding, with more types and styles than ever. The key here is getting enough lighting without overdoing it. You do not need the same level of light outside that you have indoors. A lot of lighting can actually be detrimental to the enjoyment of your outdoor space. When you move from a light space to a dark one, your eyes dilate to allow more light in. Bright lights or glare will reverse this, making it harder to see in a nighttime environment. So, when creating your lighting plan for an outdoor space, glare is your nemesis. Glare is defined as a bright or dazzling light. For our purposes, it is easily defined as any exposed light source that would cause you to squint. Exposed light sources beyond vintage style filament bulbs are best avoided. The trick to getting a well-lit outdoor patio is directing the light just where you need it. When it comes to ambient lighting, overhead lighting is a great option, be it outdoor pendants or even string lights. A good, sturdy string light zig-zagged over a dining or entertaining space lays down a great soft, overall light and creates an atmosphere like a French café or Italian piazza. Wall sconces can also add to the ambiance. Be sure to use lights that are up/down lights that puddle light on the ground and not ones aimed out into space. By itself, this kind of fixture will only service a space of a limited depth. So, while appropriate for defining the borders of your outdoor space, with deep patios and decks you’ll want to incorporate other fixtures to spread light evenly throughout. If a fan is needed, there are plenty of outdoor fans that offer lights as well. This is perfect for environments where temperatures don't drop at night. Keep in mind, though, that while you can kill two birds with one stone, fans may not provide the most aesthetically pleasing light options. For covered spaces, you can go with the aforementioned outdoor pendants, flushmount ceiling fixtures or even recessed lighting. Make sure you select fixtures rated for the outdoors and, of course, put them on a dimmer so you can control the light output. When it comes to task lighting, though, crank that dimmer up. Common outdoor activities like games or grilling require brighter, more direct lighting. For common spaces where games or reading might be done, make sure you specify overhead lights with enough output to work or play under. If overhead is not an option, portable table or floor lamps can also do the trick. There are a growing range of gorgeous and well-designed chargeable table lamps that will give you hours of entertainment. Plug-in floor lamps are also growing in popularity in outdoor settings, and give a really polished, high-end look. For specific tasks like grilling, look for targeted fixtures like barbeque lights to give you the precise light you need. 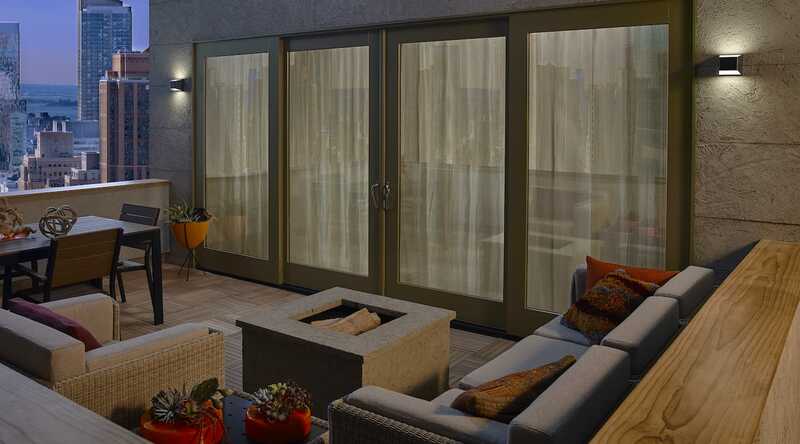 To complete your light layering in an entertainment outdoor space, remember accent lighting. This is more than just aesthetics. Low-level accent lights are perfect for defining areas and highlighting spots where a misstep may happen. Small deck and step lights are perfect for highlighting stairs or defining a boundary. This is also where you can expand off the patio and into landscape lighting, if needed. Spot and flood lights can create visual wow and expand your entertaining space into the whole yard. A well-designed outdoor space takes into account your guests’ lack of familiarity with it. While you may be able to walk around your backyard in a blindfold, guests likely cannot. To illuminate potential hazards, ambient landscape lighting is ideal. Uplighting trees or hedges is a great way to add to the overall light of the space while creating boundaries that are easily noted. From there, focused task lighting can provide safe illumination of water taps, electrical breakers and any other kind of landscaping controls. Step or deck lights placed above a technical component can be a lifesaver in a hectic situation. Accent lighting is probably the most critical category in this space. Good accent lighting can make or break the sense of safety. Changes in elevation like stairs or curbs can be treacherous. Step lights, path lights and bollards help ensure that we can move around an outdoor space easily and safely. Ensure these lights sources are low to the ground to focus light where it’s needed and not create glare. Finally, there’s the issue of your outdoor space’s security. While a good security system is key, good outdoor lighting can expand your safe area and give that system an extra buffer. Congregational spaces like front doors, side doors or breezeways—wherever you may need to pause and dig around for keys—should have adequate ambient lighting. You can accomplish this with well-placed wall sconces or overhead lighting. Flood lighting can also be used for extreme cases but is generally a more aggressive style of lighting, blinding anyone on the receiving end. Places outside the home that may be accessed at night on a regular basis should have lighting that’s easily accessible. A trash and recycling bin storage area is a great example of a space where a good wall sconce can add a measure of comfort and safety. For spaces that are not necessarily used on a regular basis, lighting with motion or photo sensors is a great idea. Motion and photo sensors are great power-saving additions for any outdoor lighting setup. Motion sensors can be included on a fixture or, more gracefully, added to a circuit so any fixture can be used. For more commonly used spaces, a photo sensor—often called a photocell—works to turn the fixture on and off with the celestial changes and saves you flicking that switch twice a day. Giant floodlights can be effective at creating shock, but strategically placed accent lighting can actually be more effective at keeping unwanted visitors at bay. Larger features like trees, bushes and decorative walls can benefit immensely from the addition of landscape and hardscape lighting. Not only does it make your space look nice, but it expands the line of sight further into your space and will discourage anyone unwanted from lurking around.